From the Sanctuary of Diana at Nemi. Germanicus was a brilliant young Julio-Claudian who distinguished himself on the battlefield many times. Most notably in Germania where he inflicted serious defeats on the barbarian tribes and recovered the legionary standards lost in the catastrophic Varus disaster. He was chosen Tiberius' succesor, but died of an unknown cause. His tremendous popularity helped his son Caius (Caligula) obtain the throne after Tiberius died. Germanicus is a name, or rather a surname, which, having at first been justly acquired by the courageous and active Drusus, and deservedly continued to his son Germanicus Caesar, was afterwards assumed by many of the emperors; by some as due acknowledgement of their valour and success against the German tribes, as in the instances of Tiberius, Galba, Vitellius, Vespasian, Titus, Nerva, Trajan, Marcus Aurelius, Postumus, Claudius Gothicus, &c; by others on the most groundless and disgraceful pretensions, as in the respective cases of Caligula, Nero, Domitian, Commodus, &c.- Amongst other surnames derived from conquered countries, Valerianus and Gallienus were called not only Germanici but even Maximi; and so likewise was Postumus; but the latter with better reason, for he gained victory on victory over the Germans, and built fortresses for the Roman garrisons on the banks of the Rhine. Germanicus Caesar, the son of Drusus sen. and of Antonia junior, was born in the year of Rome 739 (B.C. 15), for he was thirty-two years of age when he died in 772 (A.D. 19). He derived the name Germanicus from his father Drusus. Being adopted by Tiberius, at the instance of Augustus, in the year 757 (A.D. 4), he began to be styled Caesar Tiberii filius, and Augusti nepos. In 760 (A.D. 7), he held the questorship, and was sent with succours to Tiberius for the war in Dalmatia. For successes gained in this campaign, he earned triumphal and pretorian honours, 763 (A.D. 10). In the year following, vested with pro-consular authority, he, in conjunction with Tiberius, made an expedition into Germany, to avenge the slughter under Varus. In 765 (A.D. 12), he was elected consul, and in 767 (A.D. 14), about the time of Augustus' death, being appointed to the legions on the Rhine, he quelled a revolt of both armies, occasioned by their repugnance to Tiberius, and their desire to have him as a successor to the empire; threatening them, in case of their persisiting, that he would put an end to his own life. And such was the effect of his firmness, that they very shortly gave in their adhesion to Tiberius. For his other exploits during the war in Germany, and the honours which he thence acquired, from 767 to 770, see the biographical notice of Tiberius. In 771 (A.D.), he was made consul for the second time at Nicopolis, in Achaia, with Tiberius for his colleague, and being sent into the East, he established Artaxias on the throne of Armenia (see p. 416), and reduced Cappadocia and Commagene to the condition of a Roman province. In 772 (A.D. 19), having gone into Egypt for the purpose of studying antiquities (cognoscendae antiquitatis causa), and thence passed into Syria, he became the victim of the indignities and evil practices of Piso, prefect of Syria, and his wife Plancina; unable to escape their snares, he fell into ill health, which was aggravated by the apprehension that poison had been administered to him by Piso; and he died at Epidaphne, near Antioch, on the 9th of October of the same year. When the tidings of his death spread abroad, it is scarcely credible what grief and consternation it caused throughout the empire, and in Rome itself; no one refraining from the most liberal abuse of Tiberius, whom the popular voice condemned as the instigator of Piso's crime. Nor was this suspicion without foundation. For it is very improbable, that Piso and Plancina would have openly acted with hosility towards a Caesar sent with plenary powers into the East, had they not been assured of the approval of Tiberius and Julia. 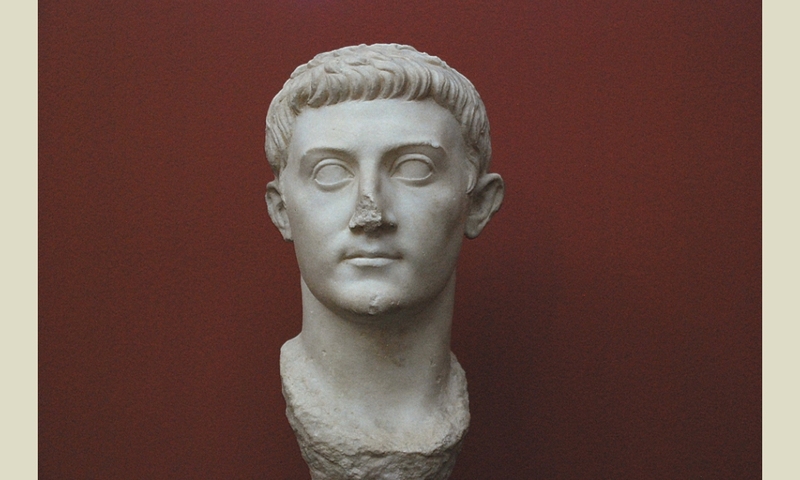 Besides, it was a sufficiently well-known fact, that Tiberius hated Germanicus, inasmuch as he feared in him a successor to the empire, on account of his popularity and the public animosity against himself. The indignation of the people knew no bounds; for even the altars of the gods were pulled down, as though they had neglected their charge, the temples were dismantled, and the Lares thrown into the streets. Even barbarian tribes were affected with pity, and there was a universal mourning, not only throughout the Roman empire, but the entire world. Assuredly, the history of the ages does not record a single instance, from the time of Alexander the Great, of any individual's decease being so bitterly and sincerely deplored; nor was this the feeling of the moment only, but it continued for many years afterwards, insomuch that the Romans used to rejoice in the prosperity, and sympathise with the misfortunes, of the children whom he left behind him. His praises became the theme of all the writers of Roman annals, who have extolled in the highest terms his advantages of person and mind, his bravery, his wisdom, his eloquence and learning, his courteous demeanour to his friends, and his clemency towards his enemies. His ashes were transported by his wife Agrippina from Syria to Rome, and deposited in the tomb of Augustus. - (Doctr. vi. 208). He married Agrippina, by whom he had nine children, six of whom survived him, -viz. Nero, Drusus, and Gaius, called Caligula; Agrippina (who married Claudius), Drusilla, and Julia Livilla. 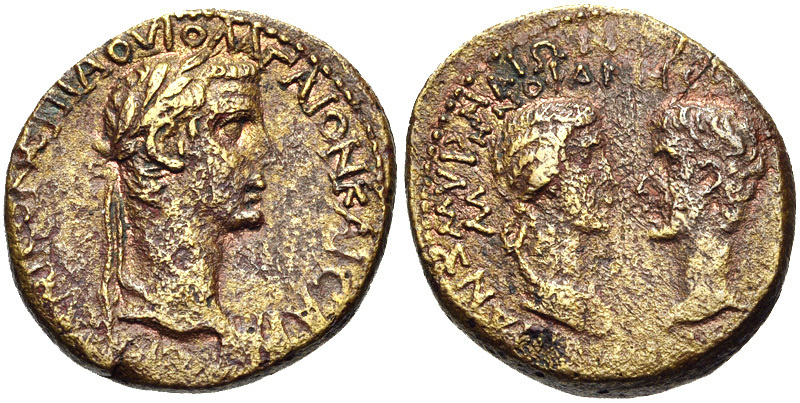 The coins struck in the honour of Germanicus are very rare in gold; of the highest rarity in first brass; common in second brass; colonial rare. Those of Roman die, bearing his portrait, were minted after his death, under Caligula and Claudius. Some of them were restored by Vespasian. On these he is styled GERMANICVS CAESAR TI. AVGUST. F. DIVI. AVG. N. (as on the foregoing cut)-also GERM. CAESAR; GERMANICVS CAES. C. CAESARIS (Caligulae) PATER.